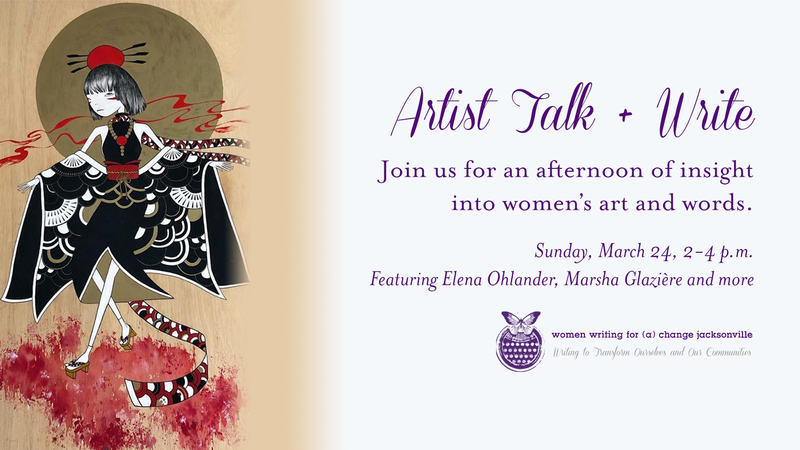 Artist Talk + Write this Sunday! Join us for a special event to hear five of our women artists talk about the work they are doing, why they do it, and how their particular feminine perspective informs and shapes their work. Featured artists include Elena Ohlander, Marsha Glaziere, Tracy Mims, Sara May, and Jennifer Bothast. Plus we’ll do some writing ourselves and share our own perspectives on this work and the work of lifting our voices in our communities through words, art, and personal expression. This will be a one-of-a-kind art interaction experience! Don’t forget to pick up one or two of the gorgeous journals we custom-made with the artwork of these fabulous women artists. All sales help us support our outreach programs. Hope to see you there! p.s. no charge for this event but donations (and art purchases) most appreciated!